With one of the most panoramic views in all of The Tryall Club and a meticulous attention to detail and design, guests staying at the 7-bedroom Hummingbird House are often so captivated that they book it again before completing their current vacation. 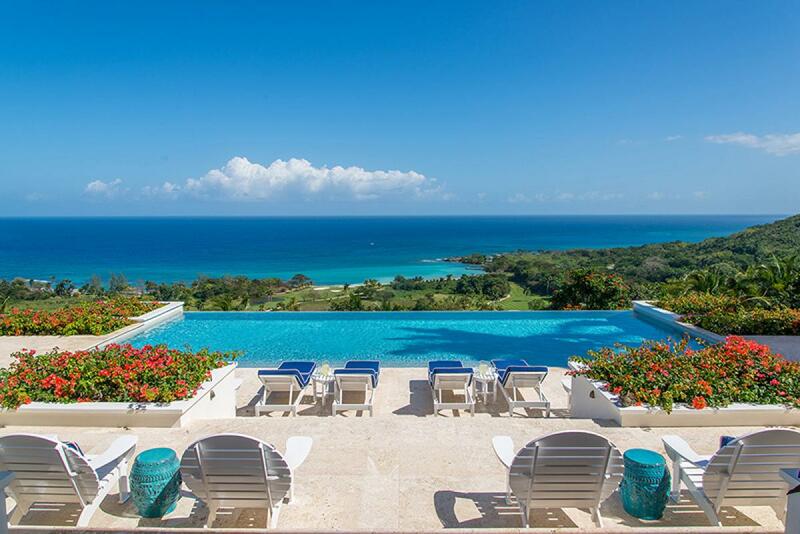 The villa is a sprawling 14,000 square feet residence with a spectacular 50 feet infinity pool, set amidst four acres of beautifully manicured gardens on Barnes Hill. Built in a modern, open, contemporary style, the level of finish and interior design is both striking and exceptional. There are three bedrooms in the main house and two bedrooms in each of the two guest cottages. The two master suites both have king size beds; one has a private plunge pool and the other a magnificent soaking tub with unobstructed ocean views. Each guest bedroom has its own private en suite bathroom and five en suites open to outdoor showers offering an invigorating natural experience. Four of the bedrooms can be configured as queens or two double beds, depending on the guest needs. Breathtaking panoramas of the rolling green fairways and the brilliant blue seas are captured from every area of the impeccably designed and capacious living spaces. pool size 50', Infinity pool deepest point 4ft 10"
Airport transfers can be arranged for this villa (guest expense).